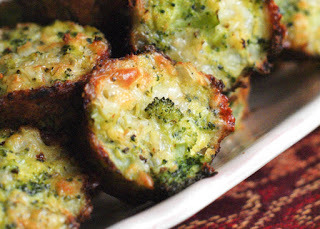 Try replacing tator tots with broccoli tots. Lay the broccoli out onto paper towels and cover with more paper towels, Press down firmly on the broccoli to absorb as much moisture as you can. Another method is to put the broccoli in the center of a dish towel and ring out the water. Finely chop the broccoli. In a large bowl, combine all of the ingredients and season with salt and pepper. Stir everything together until well mixed. Fill each muffin cup in a mini muffin tin, that has been lightly sprayed with nonstick cooking spray, to the top pushing down on the filling with your spoon so it’s nice and compacted. Note: Recipe and photo from The Two Bites Club.